Rosemary is a neonatal lecturer, programme director for MSc Advance Practice in Health and Social care and Route Leader for BSC Nursing (Neonatal Route) in the Early Years Division, School of Health Sciences. She was a neonatal sister and clinical educator in a busy tertiary neonatal unit, at Homerton University Trust between 1997-2001 prior to her appointment at City. 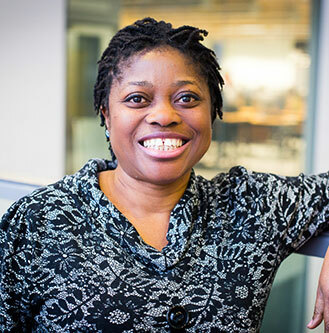 Rosemary qualified as a Registered General Nurse in Nigeria, in 1988, and completed her Diploma in Professional Nursing Studies in the UK in 1993. She has since completed her teacher training in 1998, and was awarded DG Dip, HE. She later completed her MA in Higher Education and MSC in Social Research Methods and Statistics. Rosemary's role as a Neonatal Lecturer and clinical link lecturer enables her to develop curricula tailored to meet the needs of contemporary neonatal care. One of these curricula developments is latest development of MSC Advance Clinical practice in Health and Social Care (Neonatal Route). As a neonatal the clinical link lecturer, I provide academic and clinical support/advice to nursing and midwifery students and mentors in following clinical areas: NNU Newham university Hospital, UCLH. In collaboration with the neonatologists at the Barts Health Hospitals, we provide clinical and academic training on Physical Examination of the Newborn to nurses and midwives across London hospitals. Parent satisfaction with care and communication. Lanlehin, M.B.I.R. (2017). Integrating a multi-professional learning recipe into Non-Medical Prescribing. City, University of London 21 June. newborn course in practice. RCN Advanced Nurse Practitioner Forum Conference 12-13 November, Royal College of Nursing, 20 Cavendish Square, London W1G 0RN. Lanlehin, M.B.I.R., Lanlehin, R., Dr Alangandy, N. and Brown, J. Factors associated with parents’ satisfaction with information received on the neonatal unit. REASON. Lanlehin, R.M. (2018). Boundaries between professional nursing and midwifery academics and scholarly research activities: Transitioning through communities of practice. Nurse Education Today, 64, pp. 130–131. doi:10.1016/j.nedt.2018.02.004 . Lanlehin, R.M. (2018). Self-tracking, governmentality, and Nursing and Midwifery Council's (2016) revalidation policy. Nurse Education Today, 64, pp. 125–129. doi:10.1016/j.nedt.2018.01.033 . Rayment, J., Lanlehin, R., McCourt, C. and Husain, S.M. (2017). Involving seldom-heard groups in a PPI process to inform the design of a proposed trial on the use of probiotics to prevent preterm birth: a case study. Research Involvement and Engagement, 3(1). doi:10.1186/s40900-017-0061-3 . Lanlehin, R.M. (2017). A clinical assessment tool for midwives undertaking the Newborn Infant Physical Examination. British Journal of Midwifery, 25(5), pp. 293–295. doi:10.12968/bjom.2017.25.5.293 . Burrows, S. and Lanlehin, R. (2015). Is frenotomy effective in improving breastfeeding in newborn babies with tongue-tie? A literature review. British Journal of Midwifery, 23(11), pp. 790–797. doi:10.12968/bjom.2015.23.11.790 . Sudell, J., Lanlehin, M. and hill, M. (2015). A literature review of parents’ experiences of kangaroo care in the neonatal unit. Infant, 11(3), pp. 96–99. Lanlehin, R., Aladandady, N. and Mc Court, C. (2012). Factors Associated With Parents' Satisfaction with information Received on the Neonatal Unit. Journal of Paediatrics and Child Health, 48(Supplement 1), pp. 91–91. doi:10.1111/j.1440-1754.2012.02412.x . Lanlehin, R. (2012). Factors associated with information satisfaction among parents of sick neonates in the neonatal unit. INFANT, VOLUM E 8(I S S U E 2), pp. 1–4. Lanlehin, R., Dr Noble, H. and McCourt, C. (2011). How well do midwives use skills and knowledge in examining newborns? British Journal of Midwifery, Vol. 19(Iss. 11), pp. 687–691. - MSc Dissertation Module (NMM0090). Co module leader. I supervise MSC and Undergraduate students. I am currently supervising five students. Factors Associated With Parents' Satisfaction with information Received on the Neonatal Unit. Sydney (2012). Description: Lanlehin, MBIR, Lanlehin, R, Dr Alangandy, N, and C Mc Court, FAOPS & PSANZ 2012 Congress at the Sydney Convention & Exhibition Centre. 18-21 March 2012. Factors associated with parents' satisfaction with information received on the neonatal unit. (2011). Description: Lanlehin, MBIR, Lanlehin, R, Dr Alangandy, N, and Brown, J., REASON, Neonatal Conference University of Warwick. An evaluation of how well midwives and neonatal nurses utilize skills and knowledge acquired on the advanced examination of the newborn course in practice. London (2010). Description: MBIR, Lanlehin and Dr Helen Noble, in RCN Advanced Nurse Practitioner Forum Conference, Royal College of Nursing, 12/11/2010 - 13/11/2010. Description: Katherine Twining Network Meeting 8th June - midwifery session, Queen Mary Innovation Centre.